Can you believe it's April already? Where is the time going? Anyway, another month means more lovely stuff to buy, which is presumably why you clicked this link. March saw the release of the lovely Yoshi's Crafted World, but what's next for Switch, you may be wondering as your hard-earned money burns a hole in your pocket. We've helpfully compiled a list of all the good stuff coming out at retail in April and May, so feast your eyes and get all those pennies together – you're going to need them! Labo VR is probably the most interesting Labo kit so far. This latest kit combines DIY fun, pass-and-play multiplayer and family-friendly play for a distinct first VR experience kids and families can build themselves. Just add your Nintendo Switch console and its Joy-Con controllers to feel your creations come to life as you and your family blast through an alien invasion, dive into an oceanic photo safari and more. 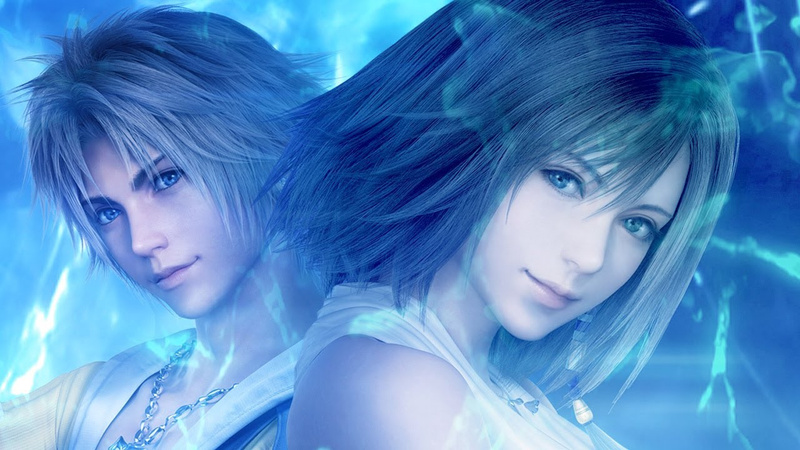 Final Fantasy X | X-2 HD Remaster is – as you’d imagine – a lovingly-remastered edition of the series in glorious HD, so if you’ve been wanting to relive your adventures (or experience the story for the first time) you will soon get a chance on Switch. Mortal Kombat is back in April and supposedly better than ever in the next evolution of the iconic franchise. Featuring a roster of new and returning classic Fighters, Mortal Kombat’s story mode continues the epic saga over 25 years in the making. We're being really spoiled for Final Fantasy games in April. Final Fantasy XII The Zodiac Age improves upon the 2006 classic Final Fantasy XII, now more beautiful and easier to play than ever. This high-definition remaster introduces several modern advancements, including reconstructed battle design and a revamped job system. Players both returning and new to the game will experience a grand adventure that spans the world of Ivalice in an entirely fresh and improved way. Resident Evil Origins Collection includes remastered versions of the critically acclaimed Resident Evil and its popular prequel, Resident Evil 0. This is a must-buy for horror fans on the Switch. Relive the American Revolution or experience it for the first time in Assassin's Creed III Remastered, with enhanced graphics and improved gameplay mechanics. Team Sonic Racing combines the best elements of arcade and fast-paced competitive style racing as you face-off with friends in intense multiplayer racing. Race together and work together as a team by sharing power-ups and speed boosts. Watch out Mario, a new challenger for the best karting game is on the way! Aside from the highlighted games above, there are lots more Switch retail games which might take your fancy in April and beyond. We saw a whole slew of interesting accessories released for the Switch in the past few months, but more are on the way. Here are some tantalising accessories coming up in April and beyond, which we found for your consideration. So that's it for April and May - did we miss anything? Let us know with a comment and also tell us if you've pre-ordered any of these goodies! Not the busiest couple of months but still enough to keep me broke. If this is a drought, I'm afraid for what's to come.. My poor poor wallet. Huh, Battle World: Kronos? It's a game that should be interesting to turn-based strategy fans, but for some reason it didn't grab me, even though I liked the core system. Possibly because campaign was simply a little dull. The game is Advance Wars-esque, but more sci fi and on hexes instead of squares (which in most cases is an improvement). So far nothing until June with Mario Maker 2 (waiting for physical Cuphead so not buying in April), hope that an April Direct makes the gap before Mario Maker 2 more interesting. A slow couple of months to be sure, but that's fine, my backlog is huge and the past few months have been a strain on my wallet. I have time off at the end of the month to catch up on some of it. Guacamelee One-Two Punch Collection though should be worth it, I have it on pre-order from 365 Games already. Pre-purchased Resident Evil 4. Yeah, I know it's overpriced, but I had $30 worth of gold points so I basically got it for free. Worth it since it's one of the few big legendary games (along with games like FFVII and Metal Gear Solid 3) I still have yet to try. May 21st can't get here soon enough. And also after i purchased Pokemon Omega Ruby 3DS USA yesterday. love these updates, definatley need ken daisy and young link. Buying Resident Evil 1 digitally when it comes out. Cheaper than Ultra Street Fighter II and I got that day one because a good game is a good game. Didn't expect to see people commenting about slow month. I'm personally drowning in choices. I have 5 games that I'm really looking forward to and now that I saw this list, I noticed that there are actually couple more games I didn't even realize were also coming this month. I'll be spending a lot of money on games this month. At least some of the games I'm interested in are lower priced digital only games. @Giygas_95 I’m jealous. I wish I was playing through RE4 for the first time again, such a good game. Have fun my friend! Dragons Dogma and Link Amiibo for me, that is all! That's kinda curious that you're giving a shout out to Langrisser, isn't that japanese only atm? Both FF titles are a must and both Wasteland 2 and Dragon's Dogma will be heavily considered. @beazlen1 Thanks, I will! I'm actually gonna do a chronological play through. Gonna play Zero and REmake on Switch, then 2 Remake on PS4, probably gonna skip 3 unless it gets remade, then 4 and Revelations on Switch, 5 on PS4, Revelations 2 on Switch, then 6 and 7 on PS4. I'm aware 5 and 6 have less than stellar reputations, but I still want to try them. Starting with Cuphead, the games are gonna start ramping up for me. I've been trying to save my money cause summer is gonna be crazy good. Also Ubisoft, call me when you port Black Flag, you can keep AC: 3 in the meantime, thanks. Not Final Fantasy month for me, it will be when it’s the same price as the PS4 version. How TF is this a slow month? There's one game I've been waiting to play since it got announced (Super Dragon Ball Heroes), and a couple I may or may not get depending on my mood (MK11, FF12, Team Sonic Racing). Darksiders and Dragon's Dogma for me. I might get X and X-2 but it will be imported. I need my physical copies. Depending on whether I get review codes for them, I'll definitely be picking up both the Final Fantasy ports. Just not sure if I'll get them immediately or if I'll wait for their prices to inevitably lower. Aside from that not too much for me, though I may pick up Mortal Kombat 11 out of sheer morbid curiosity. Wow, very strong month! FF12 for me! FFX import from PlayAsia and Dragons Dogma (US import) ordered from a UK retailer. Considering I've got FF7 and Golf Story on the go I think I am set until they surprise announce Pikmin 4 coming this summer (fingers crossed). Hmm. Interested to see how NeoAtlas and For the King review. Want Mutant Year Zero: Road to Eden Deluxe Edition... But All the way back in June. When they announced all those Final Fantasy games I was really excited. Then they dumped the lot in a space of about a month and for new game prices. Really couldn’t care less now. Why is every single thing you post about how you got games cheaper on some other platform? Seriously guy, I can predict exactly what you're gonna post before you even post it. "Oh ya I bought this for less on PC/PS4 a year ago, here see the proof!" Nobody's gonna suddenly not want to buy a game just because you bought it $20 cheaper elsewhere. You're trying too hard in your desperation here. I bought plenty of games cheaper on other platforms. Doesnt mean its gonna launch for less on Switch (or any other platform, as FFXII launched for $50 on PS4, and $50 on STEAM a year later, and $50 on Switch and X1 a year after that). Dont like it dont buy it, but we dont need a post on every article about what price you got a game for. @Giygas_95 wow nice!! That’s not quite chronological though. Zero came out in 2002 on GC after 3 (1999) and before 4 (2005). Zero is quite similar to RE1 so I’d recommend not playing them back to back. Anyway which ever way you do it, have fun!! That Peach controller is hideous. @beazlen1 By chronological I mean going by the series timeline rather than when the games were actually released. I do think I'll have fun though, I love a good survival horror game. I know people like to crap on The Last of Us, but that actually is a really fun survival horror, and Revelations on the 3DS was too. @JaxonH @Anti-Matter is the one that I get annoyed about. I’ve read 3-4 of his comments in the past week and almost everyone was about some Pokémon game he got in Japan. I already have preordered Super Dragon Ball Heroes from my retailer in my town. I'm going to pick it up this weekend. @JaxonH If the Switch had more new or well priced ports on the Schedule - I would not keep mentioning it. 🙃 No like I can say it about "Mutant Year Zero: Road To Eden"
And I rarely comment on anyones post - so not about "changing" anyones mind - it is a comment. Just like your "My spread is gonna be fat" list, is not about convincing me they worth buying. I read it and move on. Errr... You not very good at predicting me. You just focus on them. Wait a minute....When did Amiibo go from $12.99 USD to $15.99? I have my own shopping day schedule. None of your business to get annoyed by my plans. It's a repeated line I've seen 3 times from you just reading posts when I got up this morning. Showing half a dozen other posts doesnt mean you dont say it whenever you get the chance. Cause you most certainly do. Neo Atlas for the win. My wallet is going supernova. So many games I’ve been waiting for. Slow month? Are you kidding? We just got a Nintendo first party title with Yoshi last week. We are getting lots of new third party ports and a lot of indie titles. Darksiders, MK11 and Cuphead alone will satisfy my itch for a new game (and empty out my wallet). I don't need a Nintendo First Party release every single month to make it a non-slow month. Plus my backlog is growing. @JaxonH I have mentioned it when it happens. The issue should be that it happens so often, not that I point it out. And my FF purchase was not a "sale"... that was a Pre-Order. And not about "badge of honor"... back in 2017 it had a "steel book cover" and a Soundtrack DLC for the 49.99 pre-orders. Or you got it for 39.99 with the reversible cover only... This now is 2 years later and after it sold in the millions. If people do not start to expect more, there will be no reason for the publishers to give more. @Agramonte "If people do not start to expect more, there will be no reason for the publishers to give more." However publishers cheapening out and doing less and less is an ongoing popular trend and unfortunately our expectations and buying habits I fear will have no effect. If we don't buy it they simply will stop publishing those kind of games. It's sad and infuriating to see how greedy they've become (or always were) and will continue to be. I guess I’m unsure how Gold points actually work, I went all digital on my switch and I have a bunch of gold points but no reference as to the value that I shoood have with them. @Agramonte Meh, ever heard of "price high first, then price lower later" Pretty sure the majority of businesses do that and yes releasing it higher on a different system still uses that regardless of when it came out on other systems. It happens often because Switch didnt release until 2017 and its playing catch up. You dont get the benefit of sale prices on day one for a newly ported game. You get that benefit after it's been out a while. We dont need Captain Obvious declaring games that have been out for a while go on sale from time to time. Everyone is well aware. I think there’s an interesting couple of games in here, Labo VR, Mutant Year Zero, Crash Team Racing, Bomber Crew, Guacamelee, Saints Row and Mortal Kombat are all on my radar. Another load to add to the list of games I’ve already missed! FFXII > FFX. Fight me. April and May are really strong months. I'm interested in a lot here, highlights being Dragon's Dogma and Mortal Kombat. Funny enough, those two launch on the same day here in the States. What a dreadful first 6 months of 2019. I regret complaining about the WiiU ports last year. I seriously regret complaining lol. Dogma looks cool, but Cuphead (not shown above because NL can't be bothered if they can't make money off a digital sale) and MK11 really saved spring (the 2 most unlikely releases). Blaster Master Zero 2 and PlayAsia-ing Phoenix Wright early also saved March for me. Kinda of tired of buying to try games I'm not super into tho. I'll get Darksiders tomorrow or an FF7 last week just because...there's nothing new to play or nothing new for me. I don't want cardboard bird VR. I don't want another uninspired BORING challenge-less platformer like Yoshi, unless there's something else coming out with it. Miss being so excited at LEAST every other month to drive and pick up a game that I'd have to immediately play it in my car, like in 2017. Feels so weird now. Both Final Fantasy titles for me. Also, 40 dollars what?! I adored both OPUS games but 40 dollars to have them together on a physical release is massively overpriced! I generally prefer physical releases, but this is clearly milking the people who only buy physical copies! Aww geez I need to sit down. My bank account is gonna so beat me up over the next two months. Can we pump the brakes on releases for a bit? I've always wanted to play the Langrisser games, but I don't believe any of them have ever been officially translated. (there's a fan translation for the original MD release I think). It's too bad the Switch HD make-over ditches the absolutely beautiful Satoshi Urushihara character designs (which are featured on the Limited Edition box cover) for designs which are horribly generic and uninteresting. Does Nintendo realize that we have bills to pay and food to buy for the fridge lol? There are waaaaaaay too many games that I want and they forgot to put Cuphead on the list. Great time to be a Switch owner! Why is there an European release of Sphinx on that list? That game is allready aviable to order. @IceEarthGuard Sure, but that is why marketplace competition is great for consumers. We have tons of options to compare on Value, Time to Market and Quality of any given piece of software. Always a good thing. @JaxonH Order was on 5/2017... game came out on PS4 on July/2017. Nothing to do with old discounted games. Also, no point in me subsidizing the fact Nintendo has been behind the times on 3rd party for more than a decade now (they been playing "catch-up" long before the Switch). They can reach out to developers to try and fix that. I can wait, tons of good new games to play elsewhere till they do. The vast majority of people who bought that game in 2017 paid $50, so pointing out you paid less doesnt really mean much. And, that's fine. You do you. I dont think anyone takes issue with you waiting. Most people are too preoccupied enjoying great games to care if you also partake or not. Theres a ton of happy Switch owners thrilled to see these games come over, either because they're Nintendo only or because they just want a handheld or hybrid version. If that's not you, cool. But theres no need to constantly try to flaunt getting a game cheaper. Any game that's being ported is obviously available cheaper. That's because its not an apples to apples comparison. Launch price to launch price it's the same on Switch and Xbox in 2019 as it was on Steam in 2018 as it was on PS4 in 2017. MH World and DB Fighter Z and countless other PC games arrive a year or more later and are still full price. That's how the world works. It's no different on Switch. Idk why you're even commenting anyways when by your own admission your not interested in ports. You're not gonna buy these games on Switch anyways. Yet you try to marginalize them for costing more on their release day than versions that have been out long enough to have sales, despite being equal launch day to launch day, and despite being standard practice across the board on all platforms, even PC. @JaxonH Even if they did - they got a Steel book and a DLC soundtrack for those $50. It was a choice to skip on the cheaper version. And you keep mentioning sales - it was not a sale. Yes... it is a standard practice. Why you have tons of comments this month on rehashed Assassin Creed 3... User score already tanked on Metacritic - with more than one person pointing out the price. Overpriced rehashed games are nonsense on every platform. And people point it out on PC and PS4 also. Fine that they love playing old games. Like I said before - I do not comment on anyones post when they say they happy some old game makes it on Switch. Just like it is fine I am not one of them. No, I am "not interested in old ports at insane prices" (on any platform) very different from "not interested in ports". Dragon Quest is a year late and at the same price... but it has complete new orchestra soundtrack, voices and scenarios. They actually putting an effort. Nobody cares if you dont want to buy a port at a given price. But we don't need a public service announcement for every ported game on Switch declaring you got it for a cheaper price. Of course you did. That's as obvious as the sky is blue. Games that have been out for a while tend to sell for less, on the platform it's been out on, not all future platforms. And whether you got it on sale or not, it's a FACT the game launched for the same price. So what you paid for it is irrelevant. The point is, pricing is based on demand. As demand drops, price drops to increase quantity demanded. Economics 101. You and I are not entitled to **** but what the market demand dictates. When a game is ported, a new audience = new demand, and new value not previously offered (hybrid play) = new demand. When everyone willing to buy the game at said price buys the game, demand will drop and they will respond with sale prices to increase quantity demanded. You're complaining about economic principles. You're not gonna get a game for the same price as some platform it released on a year ago, because it hasn't had the opportunity to satisfy demand at the normal price. THAT ALWAYS COMES FIRST. It's a transient economic truth. Only when the publisher deems demand so low they have to begin with a discount will you see such. @JaxonH and nobody is asking you to moderate comments on this board. If you do not care what I think... then Don't - no need to repeat yourself each post. Same way I do not comment every single time you gush over an old game on Switch. I get it, you like playing old games on the GO at any price. Others do not - Take your own advice and let it go. Different people like playing different games at all kinds of different prices, it just comes down to whether the game is new for them, what they can afford, etc. And no, I dont pay "any price". But $40 ($31.99 GCU) I'll gladly pay all day long for a quality hybrid game I havent played, heck I'd pay it even if I HAVE played it, if it's a game I love. "Old" has nothing to do with anything. It's why FFXII was $50 on PS4 and STEAM when it launched. Because old means jack. Demand and appeal means everything. Me being excited for a game is why we come here. To talk about games we're excited for. If you're not excited, cool, go talk about something else then. Heck, even say you're not interested. Thats fine too. What we DON'T need is you advocating what others do with their money. You do you and leave others to make their own decisions without you trying to shame them or ridicule them for "paying more than you did". It accomplishes nothing. Anyone who isnt willing to buy a game at a given price is not going to buy it regardless of what you say, and anyone willing to buy a game at a price IS going to buy it regardless of what you say. Everyone on the planet is aware games that are already out elsewhere can be had for less elsewhere. Funnily enough, if people wanted the games for less elsewhere they'd have already bought it. People aren't interested in Switch versions because they're ignorant of cheaper versions existing elsewhere. EVERYONE KNOWS.